The ocean is a significant influence on Earth's weather and climate. The ocean covers 70% of the global surface. This great reservoir continuously exchanges heat, moisture, and carbon with the atmosphere, driving our weather patterns and influencing the slow, subtle changes in our climate. The oceans influence climate by absorbing solar radiation and releasing heat needed to drive the atmospheric circulation, by releasing aerosols that influence cloud cover, by emitting most of the water that falls on land as rain, by absorbing carbon dioxide from the atmosphere and storing it for years to millions of years. The oceans absorb much of the solar energy that reaches earth, and thanks to the high heat capacity of water, the oceans can slowly release heat over many months or years. The oceans store more heat in the uppermost 3 meters (10 feet) that the entire atmosphere, the key to understanding global climate change is inextricably linked to the ocean. Climate is influenced by storage of heat and CARBON DIOXIDE in the ocean, which depends on both physical and biological processes. Let's look at some of these processes. At the end of the last ice age, about 15,000 years ago, and the ice sheets melted away and climate warmed at that time. Ice sheets began to grow, and climate cool about 130,000 years ago at the beginning of the last ice age. About 130,000 years ago, fed by evaporation of ocean waters, the polar ice caps thickened and expanded Earth cooled by almost 12° C and global sea level to drop 130m below its current level. About 15,000 years ago, this process was reversed as more sunlight reached areas near the Arctic Circle, and Earth emerged from the ice age. Earth is about 8° Celsius (14° Fahrenheit) warmer today than it was then. Still recovering from the ice age, global sea level continues to rise. The past century alone has seen global temperature increase by 0.6 degree Celsius (1 degree Fahrenheit), and the average global sea level over the past decade has risen steadily. Is this just part of the natural cycle? How much of this warming is due to the burning of fossil fuels? Is human nature affecting Mother Nature? What should we do? Our response to the challenge of global warming begins by formulating the right set of questions. The first step in addressing the issue of global warming is to recognize that the warming pattern, if it continues, will probably not be uniform. The term "global warming" only tells part of the story; our attention should be focused on "global climate change." The real threat may not be the gradual rise in global temperature and sea level, but the redistribution of heat over the Earth's surface. Some spots will warm, while others will cool; these changes, and the accompanying shifts in rainfall patterns, could relocate agricultural regions across the planet. By studying the oceans from space, we can unlock a vast store of information about our changing environment. 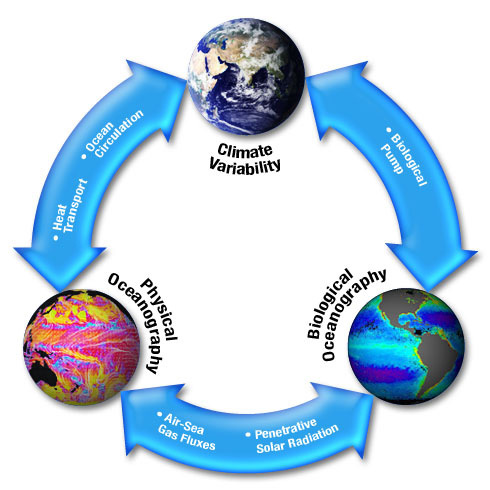 This diagram shows the relationship between physical and biological oceanography and climate variability. Heat transport and ocean circulation are key factors between physical oceanography and climate variability. Biological oceanography impacts climate through the biological pump. Together, air-sea gas fluxes and penetrative solar radiation are feedbacks between physical and biological oceanography processes that ultimately influence climate. Climate is affected by both the biological and physical processes of the oceans. In addition, physical and biological processes affect each other creating a complex system. Both the ocean and the atmosphere transport roughly equal amounts of heat from Earth's equatorial regions - which are intensely heated by the Sun - toward the icy poles, which receive relatively little solar radiation. The atmosphere transports heat through a complex, worldwide pattern of winds; blowing across the sea surface, these winds drive corresponding patterns of ocean currents. But the ocean currents move more slowly than the winds, and have much higher heat storage capacity. The winds drive ocean circulation transporting warm water to the poles along the sea surface. As the water flows poleward, it releases heat into the atmosphere. In the far North Atlantic, some water sinks to the ocean floor. This water is eventually brought to the surface in many regions by mixing in the ocean, completing the oceanic conveyor belt (see below). Changes in the distribution of heat within the belt are measured on time scales from tens to hundreds of years. While variations close to the ocean surface may induce relatively short-term climate changes, long-term changes in the deep ocean may not be detected for many generations. The ocean is the thermal memory of the climate system. Carbon dioxide is also transferred through the air-sea interface. Deep water of the ocean can store carbon dioxide for centuries. Carbon dioxide dissolves in cold water at high latitudes, and is subducted with the water. It stays in the deeper ocean for years to centuries before the water is mixed back to the surface and warmed by the sun. The warm water releases carbon dioxide back to the atmosphere. Thus the conveyor belt described below carries carbon dioxide into the deep ocean. Some (but not all, or even a large part) of this water comes to the surface in the tropical Pacific perhaps 1000 years later, releasing carbon dioxide stored for that period. The physical temperature of the ocean helps regulate the amount of carbon dioxide is released or absorbed into the water. Cold water can dissolve more carbon dioxide than warm water. Temperature of ocean is also impacted the biological pump. Penetrative solar radiation warms the ocean surface causing more carbon dioxide to be released into the atmosphere. Oceanic processes of air-sea gas fluxes effect biological production and consequentially impacting climate. But as plant growth increases, the water gets cloudy and prevents the solar radiation from penetrating beneath the ocean surface. NASA satellite observations of the oceans of the past three decades have improved our understanding of global climate change by making global measurements needed for modeling the ocean-atmosphere climate system. NASA uses several instruments to get sea-surface temperature (AVHRR or other), height (altimeter), winds (scatterometers), productivity (MODIS), and salinity (future instruments). Global data sets available on time scales of days to years (and, looking ahead, to decades) have been and will be a vital resource for scientists and policy makers in a wide range of fields. Ocean surface topography and currents, vector winds (both speed and direction), sea-surface temperature, and salinity are the critical variables for understanding the ocean-climate connection. Scatterometers are used to measure vector winds. The SeaWinds scatterometer has provided scientists with the most detailed, continuous global view of ocean-surface winds to date, including the detailed structure of hurricanes, wide-driven circulation, and changes in the polar sea-ice masses. Scatterometer signals can penetrate through clouds and haze to measure conditions at the ocean surface, making them the only proven satellite instruments capable of measuring vector winds at sea level day and night, in nearly all weather conditions. Combined with data from Topex/Poseidon, Jason-1, and weather satellites, moorings and drifters, data from SeaWinds and its follow-on missions will be used to study long-term change. Earth's weather patterns such as El Niño, and the Northern Oscillation, which affect the hydrologic and bio-geochemical balance of the ocean-atmosphere system. 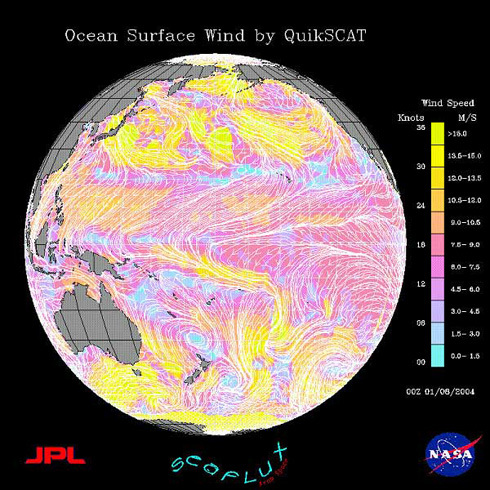 The SeaWinds scatterometer aboard NASA's QuikSCAT satellite collected the data used to create this multicolored image of winds on the surface of the Pacific Ocean. This image taken on Jan. 8, 2004, shows near-surface winds 10 meters above the ocean surface. QuikScat carries the SeaWinds scatterometer, a specialized microwave radar that measures near-surface wind speed and direction under all weather and cloud conditions over the Earth's oceans. In recent years, the ability to detect and track severe storms has been dramatically enhanced by the advent of weather satellites. Data from the SeaWinds scatterometer is augmenting traditional satellite images of clouds by providing direct measurements of surface winds to compare with the observed cloud patterns in an effort to better determine a hurricane's location, direction, structure, and strength. Specifically, these wind data are helping meteorologists to more accurately identify the extent of gale-force winds associated with a storm, while supplying inputs to numerical models that provide advanced warning of high waves and flooding. Credit: QuikSCAT team at NASA's Jet Propulsion Laboratory. Radar altimeters like those on the Topex/Poseidon and Jason missions, are used to measure ocean surface topography. Bouncing radio waves off the ocean surface and timing their return with incredible accuracy, these instruments tell us the distance from the satellite to the sea surface within a few centimeters - the equivalent of sensing the thickness of a dime from a jet flying at 35,000 feet! At the same time, special tracking systems on the satellites give their position relative to the center of mass of Earth also with an accuracy of a few centimeters. By subtracting the height of the satellite above the sea from the height of the satellite above the center of mass, scientists calculate maps of the sea-surface height and changes in the height due to tides, changing currents, heat stored in the ocean, and amount of water in the ocean. By mapping the topography of the ocean we can determine the speed and direction of ocean currents. Just as wind blows around high- and low-pressure centers in the atmosphere, water flows around the high and lows of the ocean surface. TOPEX/Poseidon & Jason-1 View of Hurricane Isabel September 27, 2003. As Hurricane Isabel slammed into the North Carolina Coast this month, TOPEX/Poseidon and Jason-1 orbited calmly overhead. 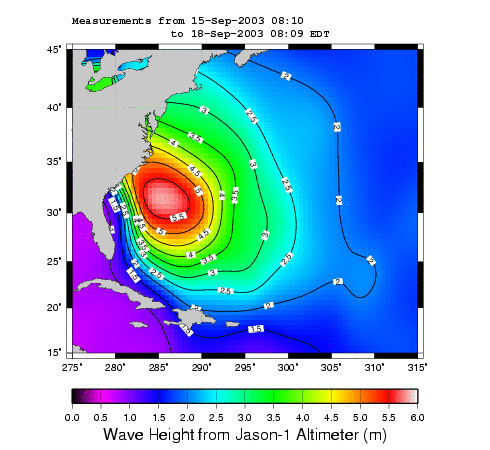 This is a false color illustration of wave height off the east coast of the United Stated on September 15, 2003 shows a significant increase in wave height to over 5 meters beneath Hurricane Isabel. Maps of sea-surface height are most useful when they are converted to topographic maps. To determine topography of the sea-surface, height maps are compared with a gravitational reference map that shows the hills and valleys of a motionless ocean due to variations in the pull of gravity. The GRACE (Gravity Recovery and Climate Experiment) mission will provide very accurate maps of gravity that will allow us to greatly improve our knowledge of ocean circulation. GRACE has provided gravity measurements that are up to 100 times more accurate than previous values. This improved accuracy will lead the way to break-throughs in our understanding of ocean circulation and heat transport. Two animations showing sea surface height (SSH) and sea surface temperature (SST) Anomalies in the Pacific Ocean from October 1992 to August 2002. The increase in temperature and height in the equatorial region west of South America illustrates the 1997-98 El Nino event. Sea-surface height is shown relative to normal with normal shown as green. Blue and purple areas represent heights measuring between 8 and 24 centimeters (3 and 9 inches) lower than normal. Red and white areas represent higher than normal sea-surface heights and indicate warmer water. These areas are between 8 and 24 centimeters, (3 and 9 inches) higher than normal. Water is an enormously efficient heat-sink. Solar heat absorbed by bodies of water during the day, or in the summer, is released at night, or in winter. But the heat in the ocean is also circulating. Temperature & Salinity control the sinking of surface water to the deep ocean, which affects long-term climate change. Such sinking is also a principal mechanism by which the oceans store and transport heat and carbon dioxide. Together, temperature and salinity differences drive a global circulation within the ocean sometimes called the Global Conveyor Belt. "The Global Conveyer Belt for Heat" represents in a simple way how ocean currents carry warm surface waters from the equator toward the poles and moderate global climate. This global circuit takes up to 1,000 years to complete. 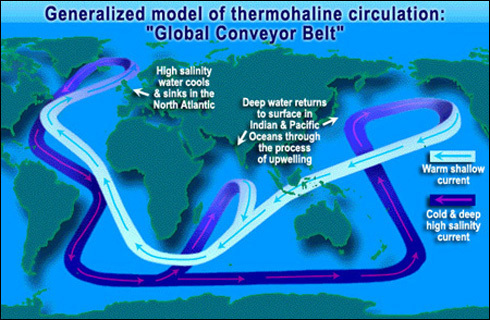 This illustration shows the generalized model of this thermohaline circulation: 'Global Conveyor Belt.' Cold deep high salinity currents circulating from the north Atlantic Ocean to the southern Atlantic Ocean and east to the Indian Ocean. Deep water returns to the surface in the Indian and Pacific Oceans through the process of upwelling. The warm shallow current then returns west past the Indian Ocean, round South Africa and up to the North Atlantic where the water becomes saltier and colder and sinks starting the process all over again. The heat in the water is carried to higher latitudes by ocean currents where it is released into the atmosphere. Water chilled by colder temperatures at high latitudes contracts (thus gets more dense). In some regions where the water is also very salty, such as the far North Atlantic, the water becomes dense enough to sink to the bottom. Mixing in the deep ocean due to winds and tides brings the cold water back to the surface everywhere around the ocean. Some reaches the surface via the global ocean water circulation conveyor belt to complete the cycle. During this circulation of cold and warm water, carbon dioxide is also transported. Cold water absorbs carbon dioxide from the atmosphere, and some sinks deep into the ocean. When deep water comes to the surface in the tropics, it is warmed, and the carbon dioxide is released back to the atmosphere. Salinity can be as important as temperature in determining density of seawater in some regions such as the western tropical Pacific and the far North Atlantic. Rain reduces the salinity, especially in regions of very heavy rain. Some tropical areas get 3,000 to 5,000 millimeters of rain each year. Evaporation increases salinity because as evaporation occurs, salt is left behind thus making surface water denser. Evaporation in the tropics averages 2,000 millimeters per year. This denser saltier water sinks into the ocean contributing to the global circulation patterns and mixing. Ocean salinity measurements have been few and infrequent, and in many places salinity has remained unmeasured. Remotely sensed salinity measurements hold the promise of greatly improving our ocean models. This is the challenge of project Aquarius, a NASA mission scheduled to launch in 2008, which will enable us to further refine our understanding of the ocean-climate connection. The above image shows the global biosphere. The Normalized Difference Vegetation Index (NDVI) measures the amount and health of plants on land, while chlorophyll a measurements indicate the amount of phytoplankton in the ocean. Land vegetation and phytoplankton both consume atmospheric carbon dioxide. 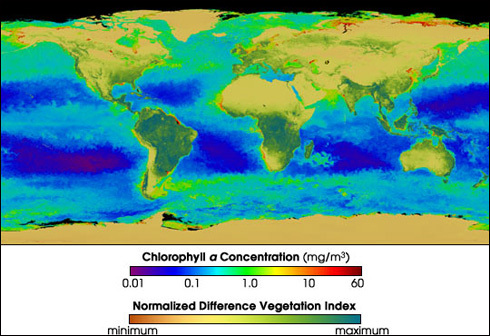 This global biosphere image reveals amount of land vegetation in addition to amounts of phytoplankton. High amounts of phytoplankton are observed in the mid to high latitudes and along the west coast of North Africa and east coast of China. This false-color map represents the Earth's carbon "metabolism"-the rate at which plants absorbed carbon out of the atmosphere. The map shows the global, annual average of the net productivity of vegetation on land and in the ocean during 2002. 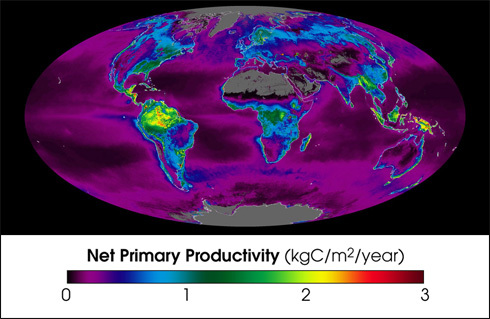 The yellow and red areas show the highest rates, ranging from 2 to 3 kilograms of carbon taken in per square meter per year. The green, blue, and purple shades show progressively lower productivity. Life in the ocean consumes and releases large quantities of carbon dioxide. Across Earth's oceans, tiny marine plants called phytoplankton use chlorophyll to capture sunlight during photosynthesis and use the energy to produce sugars. Phytoplankton are the basis of the ocean food web, and they play a significant role in Earth's climate, since they draw down carbon dioxide, a greenhouse gas, at the same rate as land plants. About half of the oxygen we breathe arises from photosynthesis in the ocean. Because of their role in the ocean's biological productivity and their impact on climate, scientists want to know how much phytoplankton the oceans contain, where they are located, how their distribution is changing with time, and how much photosynthesis they perform. They gather this information by using satellites to observe chlorophyll as an indicator of the number, or biomass, of phytoplankton cells. Probably the most important and predominant pigment in the ocean is chlorophyll-α contained in microscopic marine plants known as phytoplankton. Chlorophyll-α absorbs blue and red light and reflects green light. If the ratio of blue to green is low for an area of the ocean surface, then there is more phytoplankton present. This relationship works over a very wide range of concentrations, from less than 0.01 ton early 50 milligrams of chlorophyll per cubic meter of seawater.